Unless you never read to the bottom of my posts, I end every post with a bit of music. I started it as a way to kind of have my own thing, plus I just have a love of music in my life. Based on what the subject matter is, I try to tie the song selection with the rest of the post. In crafting the post you are reading now, I had an idea. But the idea was not coming together the way I wanted. In this post, I am focusing on three mailings from three regular contributors to my collection: P-Town Tom, Night Owl and Dime Box Nick. 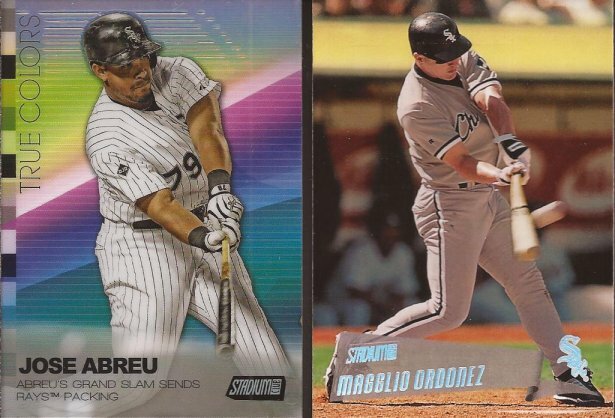 Conveniently, I had one scanned image from one package, two scanned images from the 2nd and 3 images from the cards in the third. I immediately had a song in mind that would tie them together, but numerous YouTube and Google searches were not bringing it up. After a good 20-25 minutes of frustration, my wife happened to walk into the office. I asked her about this particular song as it's been one of those tunes sung during our over 25 years of being together. If anyone could remember what I was missing, it was her. Why did I take your last name? Well, I guess with age, memories fade as I completely screwed up the song and it really does not apply to this post at all. But the cards still do, so let's show them off. 1- P-Town Tom at Waitin' Til Next Year dropped a small PWE on me. 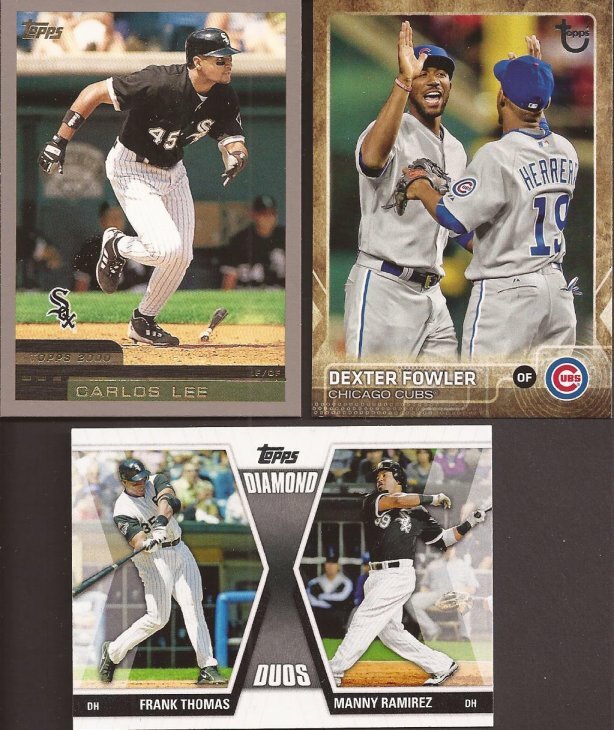 Shuck is a nice card that would fit into another binder, but I need it for the '15 team set, so it joined the high number Beckham in the Sox Box. Tom also dropped a pre MLB Eaton on me. I've actually been thinking of a player collection on him. He seems like a real team guy and I think he is finding his place on the south side filling the void when Konerko retired. Thanks Tom. 2 - Night Owl and I just drop regular mailings on each other. I believe I asked for the Fowler he pulled to add to the throwback binders. Greg will always pad out an envelope. Lee is a missing card from the 2000 set. And I think I'll take scissors to the Diamond Duos. About the only good thing of Manny in black is it made me forget about Canceso as a Sox. Though now I remember it again - dammit. Dueling Stadium Club from Night Owl. Most of the inserts from this (and last year's) Stadium Club I dislike. True Colors, though, is gorgeous. I'm hoping to complete that one. Thanks for the cards, Owl. 3 - The best part of Dime Box Nick's mailings is I'm certain he spends very little acquiring the cards. At least, I tell myself that. Geddes was a request from a box of Update Nick picked up. Again - if you get a buy back and hate it, send it to me!!! I love them all. Crede gold goes into the Crede binder. And Mr. Herrmann is another tick off the 70 set. Mmmmm Kellogg's! And uncracked ones at that. 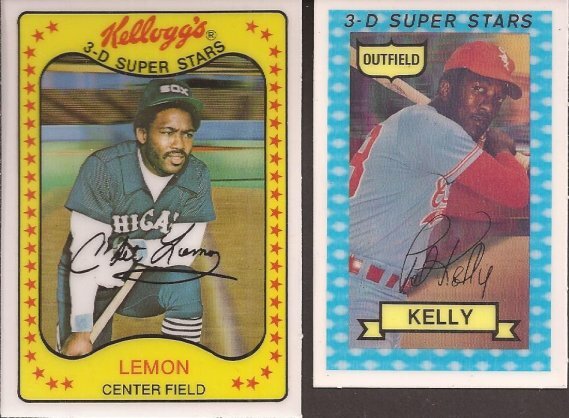 I keep all my Kellogg's at the very front of the far left row of the Sox Box. One day, I will figure out which ones I have and what I am missing to complete all the ChiSox cards. Yeah - I scanned Crede twice. I'm an idiot. Instead of digging out the cards, just ignore that card. The Walton bunting card came from a custom Star set celebrating the ROY award Walton received in 1989. Like the Fowler from Night Owl, the Blanco helps another throwback set I am completing that Topps put out in 2015. Me thinks Sooz and her bosses and trying to ruin my bank account. Finally, two of the half dozen or so miscuts Nick found, probably at the Rosemont flea market. One day, I'll organize what I have by year to get an idea which seems to be the most common set out in the world with poorly cut cards. Off the top of my head - 1973 Topps. I got a lot of them. Nick - thank you as always. So there - 1 scan from one, 2 scans from two and 3 cans from the third. But, as my wife reminded me, the video only went to 2. Two Cubs cards in one post . . . if you're not more careful someone may mistake you for a North-sider! For what it's worth, I really like Eaton. Man, he could fill a void in center for the Cubs. I had a discussion with a friend about trading Javy Baez for Eaton and my friend thought the Cubs would be giving up too much in a deal like that. IDK, seemed fair to me. 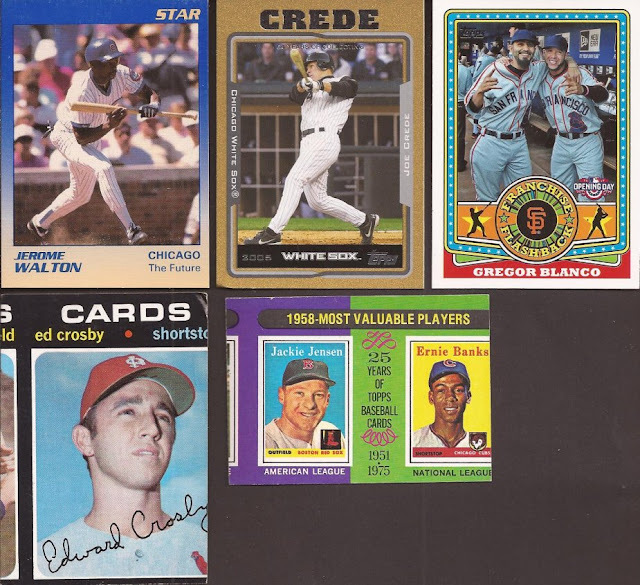 Your PWE arrived yesterday, and, as usual, it was a great one. Thanks so much! Am a card-carrying 1970s viewer of Sesame Street and I don't remember that song at all.